Description: Daftcoder - Programming. Stupidity. Rants. Logo and Header are nice and unique. 1) Curves on the Main Menu Edges. Technically this isn't BTT's tip but from the guest judge. The code below will surely add the curves on your menu. For more details see the Design part of the Guest Judge's Comment. By the way, if you don't plan to add more menu I suggest redoing the spacing on it via CSS. That way you can remove a lot of wasted space in there. Upon checking your source code, I've seen that there is something wrong with your favicon. You may want to edit it and change the source of the said icon. It tends to be relative on the current URL which creates a broken link when going to different pages. I think you can find the code on header.php of the themes (correct me if I'm wrong with the file location). This isn't a tip but rather a suggestion. Observing the sidebar feels like it's too clean. I'm not exactly saying that it should be dirty but the appearance might look a little dull and so making it a little boring. Why don't you try playing with other Wordpress plugins and extensions, I bet you can find a lot of nice things that you can place in there. 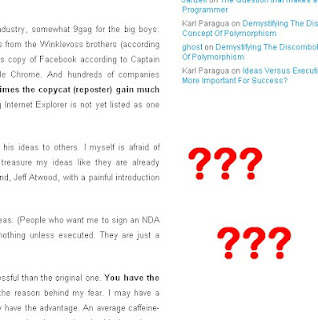 Most programming niche blogs are inclined to minimalism designs. Reason is they want to make sure that the appearance won't look too complex as compared to the articles they are writing. Now the problem with minimal design is, if overdone, it gives a boring atmosphere. Honestly, I find the upper half boring. I couldn't find it attractive and may need a little more colors or attention. Remember that the upper half of every site is a very important factor on catching the visitors interest. Homepage seems dirty for me. Imagine welcoming you visitors with a very long post followed by the other articles' title at the bottom. You may want to find a plugin to do the job on this part. A read-more plugin might help you. On the other hand, your codes were presented properly with syntax highlighter. You know what to write on your articles. It seems that you also know how to attack the audience with your posts. Programming articles are one of the hardest thing to post in my opinion since you usually make sure that what you are writing is quite understandable to regular users and yet it is detailed for knowledgeable visitors. In that aspect, you've done a good job. Just make sure that you still avoid the "TOO LONG TO READ" thing on your blog. I love the term "daft coder". It simply denotes what your blog is. I love the logo's color - plain and cool at the same time. What I don't get is how the "D" corresponds to the blog itself. What I fear about this is, most sites that uses "D" as a logo are "Designs Site", well I just thought of mentioning that and this is just my opinion. I love your approach on the posts. Honestly, I believe we have the same form of niche, it's neither "technology" nor "programming". I usually call this "PROGRAMMERS NICHE" since what you are posting is about the programmer's point of view and not just plain programming and coding stuffs. This approach make it more attracting not just for tech savvies but also for newbies and those who just want to be informed. Design is the usual black (gray) and white color that is created on the concept of minimalism. It's simple, elegant and effective. I like how headings' font size and color are not overdone to show emphasis yet exhibit clear distinction. Spacing is good. It's organized and offers browsing efficiency for readers. Whatever page the reader is, everything is accessible. I love how clear and controlled the categories are. Though social networking share buttons are very important for other bloggers, I appreciate how you display it properly as it should be and not the feeling of "insisting" and "obliging" readers to click these buttons. I like WordPress because it gives you a lot of possibilities to make your site efficient, and there is wide range of free plug-ins you may want to take advantage and add to your blog. Titles are designed to let readers anticipate whether or not they're interested in the content and yours are well thought-out and constructed. Articles are both informative and enjoying. I like how keen you are on small details like putting title and caption on images. You choose really good photos inserted just on the right part to break long texts and to refresh and to keep the fun and momentum of reader to go on till the end. It was a good read for me. Thanks. Please make sure favicon appears on all pages not just on "Home". The logo and tagline clearly inform the reader that it's not a pure technical blog which is important to point out not to mislead readers. You have exceptional writing skill. This is the part where design can be inadvertently ignore because the titles and articles already fill out the tendency of B&W (black and white design) tedium. I will definitely come and visit your blog again. But I strongly advise, though your design is fine, that you somehow give time to improve it and to make it as interesting as your posts. simplicity yung template di magulo..
pero dapat maximazine niya yun sa baba..
then tama yung judge over load yung article need to break (read more). maganda pag gagawa niya ng mga article niya.. kahit di IT course pude. for a programming niche, I'll give him an A for 'aliw factor' on his articles, di pa kasama ang nilalaman. Salamat AJ and The Undertaker sa constructive criticism! I will try to improve my site kapag may free time ako. Salamat sa mga points na nasabi dito. Ngayon ko lng din napansin about dun sa favicon. Thanks!! Nice, taas ng rating nya.